June 1, 2017 — Almost every figural graveyard sculpture accretes spooky lore of some sort, especially if time and weather have oxidized its face into a creepy rictus of horror, transmuting an expression of grief into an expression of terror, eternal hope into demonic frenzy. It’s as if the mere sight of an upright human form in a cemetery is alien enough to unnerve us. That said, if any graveyard figure were immune to such paranormal projecting, you’d think it’d be the hallowed piece of funerary art that is the Adams Memorial. 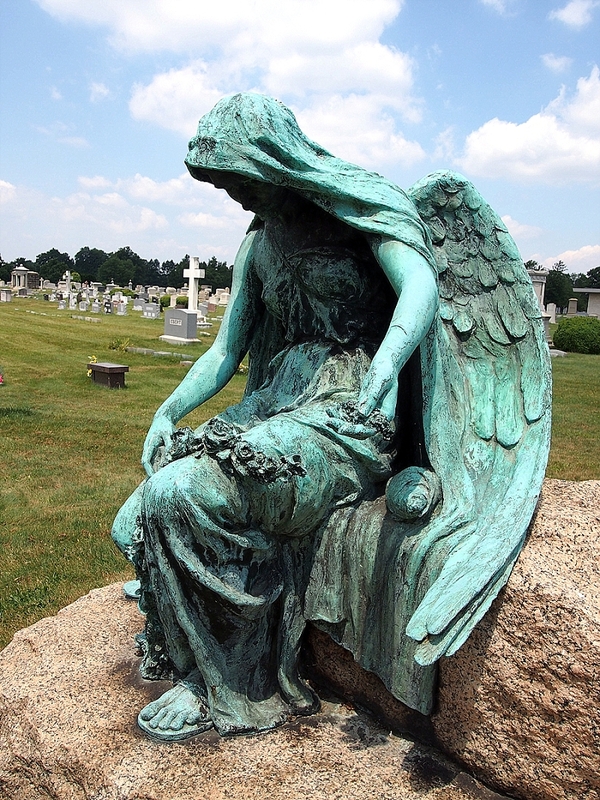 That it, of all cemetery sculptures, would transcend mere ghost stories. That teenage myths would just bounce off its bronze flanks. And, in a way, it has been immune. And, in a way, it hasn’t. from the mysteries of death to the whims of children. Almost as soon as the Adams Memorial was installed, it became a tourist destination. 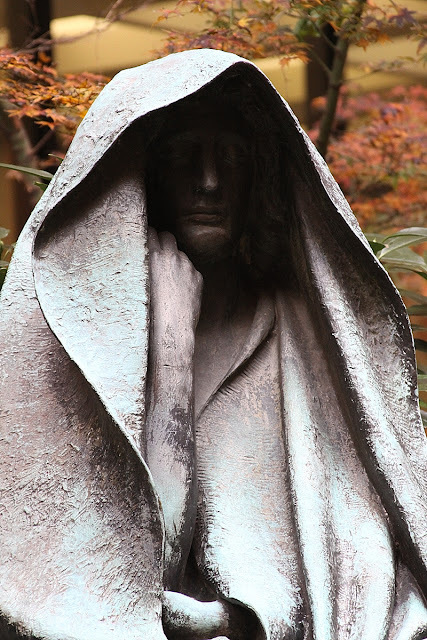 People flocked to this enigmatic statue that marked this enigmatic death as if at any minute all that bronze pondering was going to yield answers to the thorny quandaries of life and death. It was popular enough, in fact, that in 1907, about 15 years after its installation, somebody ripped off the statue completely. The Adams Memorial received that sincerest form of flattery at the behest of a General Felix Agnus, a French-born Civil War veteran and newspaper publisher in Baltimore. It’s a little fuzzy who the IP thief was. Maybe it was Agnus. Maybe it was the sculptor. Maybe it was the company that hired the sculptor. 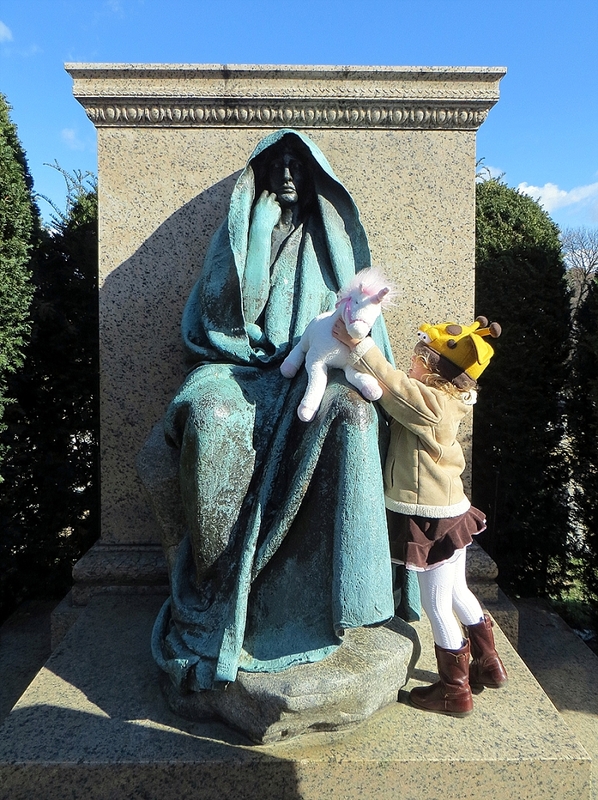 But somebody okayed the illegal copying of the Adams Memorial for General Agnus. The sculptor was Edward Pausch, who also created the death mask of William McKinley after the president’s assassination in Buffalo. 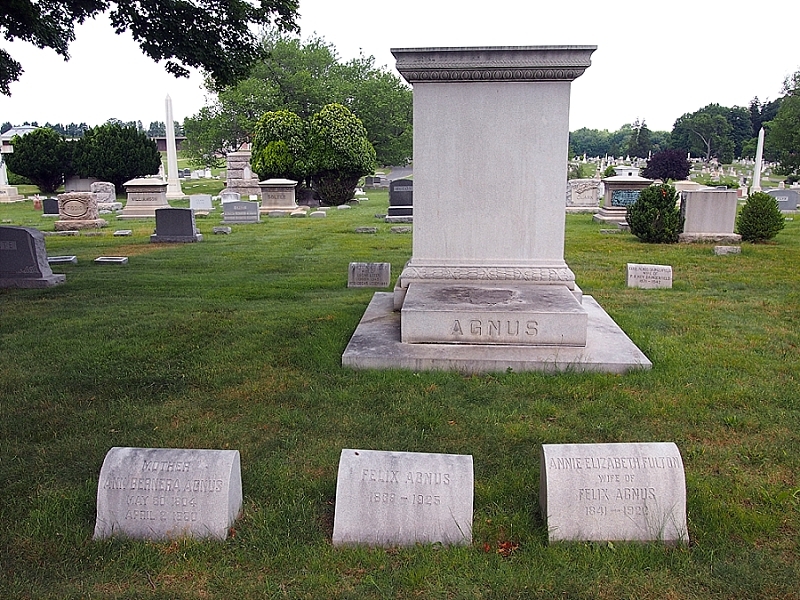 Agnus proudly erected Pausch’s replica on his family plot in Druid Ridge Cemetery in Pikesville, Maryland, about 35 miles from Rock Creek Cemetery, where the Adams Memorial looms. Then things get accusatory. It’s hard to parse the details, but it looks like the widow of Saint-Gaudens either publicly denounced the illegal copy or actually sued the general over it. The general, in turn, proclaimed his innocence and might have even sued the sculptor. Whatever the details, people got really mad over this. Even important sculptors like Chester David French weighed in on this travesty of dead weights. However, despite the transgressions of law and art and public opinion, Agnus was allowed to keep the knock-off up. And, in 1925, he was buried under it. 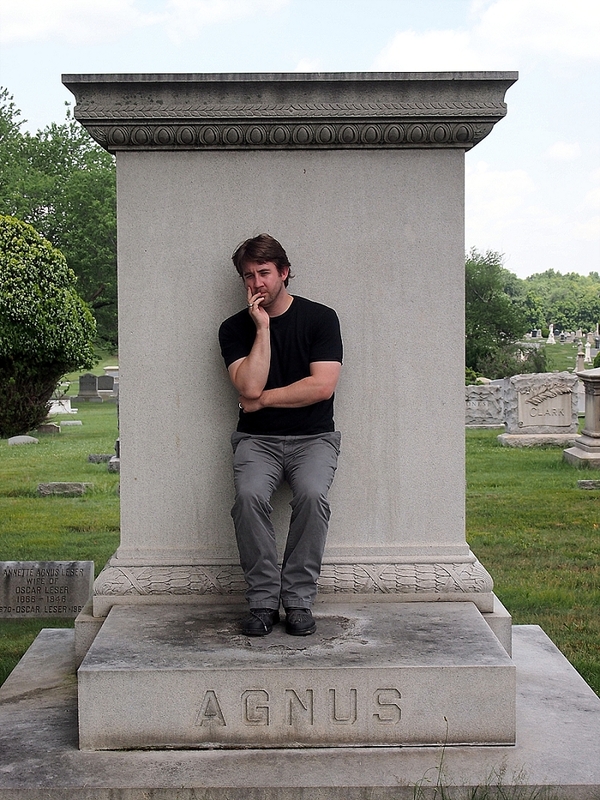 Except that when I visited Druid Ridge Cemetery a few years ago, all I found was the statue’s empty pedestal. With its tall rectangular stone backdrop, the pedestal was similar to that of the Adams Memorial, although different in key aspects. On its base was Agnes’s surname, and four loaf-stones sat like stage lights in front of it bearing the individual names of the interred. A mint-green bas relief of Agnes the size of a dinner plate adorned the back of the pedestal. This is the empty throne of the Black Aggie. And this is where things get spooky. In a bit of a karmic twist, while the Adams Memorial attracted artistic adulation, the Agnes Memorial attracted…creepy legends. The clone was dubbed the Black Aggie, due to the color of the metal and the name on its pedestal, and in the process given a gender. She was the dark shadow of the Adams Memorial. The Jekyll to its Hyde, the Liam to its Noel. She became one of Maryland’s most prominent spooks. They said her eyes glowed red at night, and if you looked into them, you’d go blind. They said that if a pregnant woman walked through her shadow, that woman would miscarry. They said that if you sat on her lap or stayed overnight with her, you would die. They said that she attracted ghosts from all corners of Druid Ridge like a paranormal beacon. That she was haunted by Clover Adams herself. That’s a lot of baggage for a hunk of bronze placidly sitting there trying to figure out eternity. Perhaps the most trafficked story of the Black Aggie was that in 1962, her arm went missing and was found in the car of a local sheet metal worker who claimed that the statue had ripped it off herself and handed it to him. Ach. That image. I want to add “in a thunderstorm” to the myth. Please circulate. Even without the atmospheric weather, this is an oddly specific story, but just a glance at a photo of the statue reveals a problem with it. You can’t really hack the Black Aggie’s arm off. Like the original sculpture, the arm is almost a solid piece with the statue. 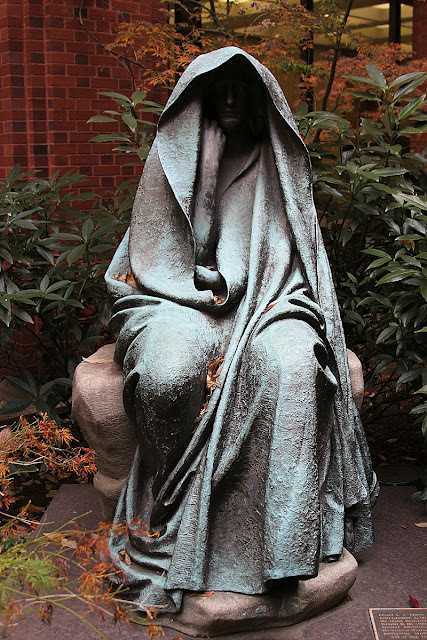 However, sharp-eyed taphophiles have pointed out a nearby grave sculpture, one that, like the Black Aggie, is female, seated, and oxidized into creepiness. 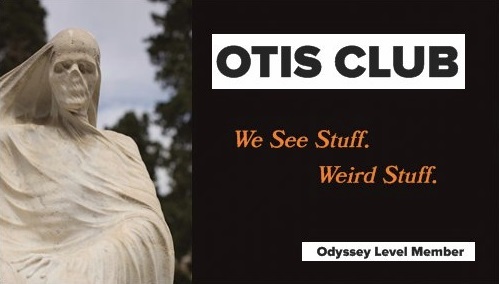 That statue’s name is Clotho, after one of the Three Fates of Greek legend who determine the individual lengths of our mortal lives. That statue has an arm extending away from the body of the sculpture, vulnerable and posed to spin out the threads of human existence. 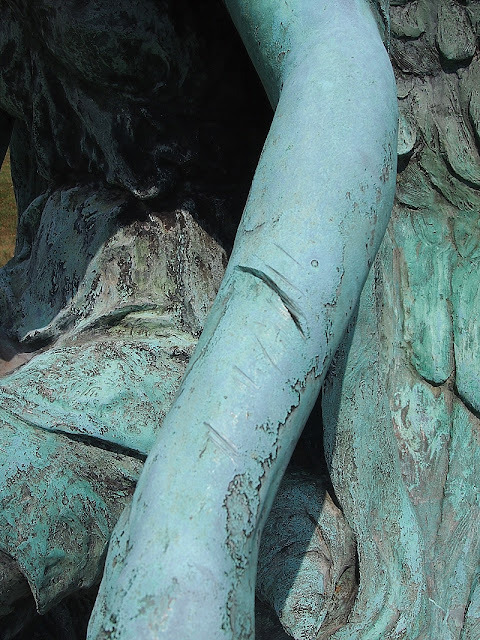 If you take a close look at her forearm, you’ll see a deep gash in the metal, like the statue was suicidal…or like someone had tried to hack the arm off. Maybe somebody looking for the legendary Black Aggie and who got confused because, you know, every figural grave statue is spooky. Regardless of the truth of that story, things did get bad with the Black Aggie. So bad, in fact, that in 1967, Druid Ridge didn’t want the statue around. Too much trouble. They ended up donating it…to the Smithsonian, where it sat in a basement that ensured nobody could stare at its eyes or walk through its shadow. Three years later, the museum would receive the authorized casting of the Adams Memorial I showed you in the first half of this article. While the Adams Memorial lorded itself in a gallery, the Black Aggie moldered the underworld of the museum archives. But that’s not the end of the Black Aggie. As a final ignominy, the museum kicked the statue out of its official collection. It became un-Smithsonian worthy. In 1987, the General Services Administration, which has the least interesting, although still important, mandate of all federal organizations—it’s basically an entire governmental department dedicated to office management—asked for the statue because they thought it would make a great garden gnome in the courtyard of the National Courts Building. And that’s where I finally caught up with the Black Aggie, blood-shot-eye to glowing-red-eye. 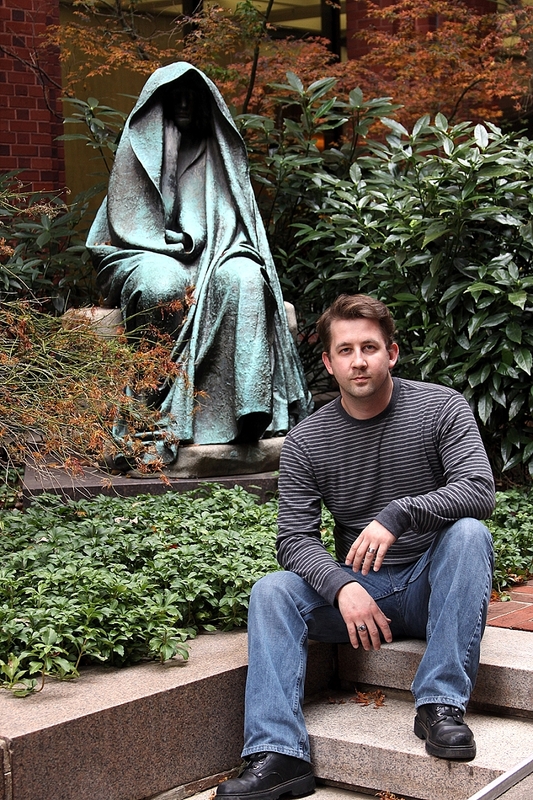 The GSA installed the statue in the courtyard of the Howard T. Markey National Courts Building on Lafayette Square. At 717 Madison Place, to be precise. It took me a couple of visits to get up close to the Black Aggie. On my first visit, I was there after hours, and the courtyard is gated shut. But if you catch the building during operations hours, you can walk right up to the more than a century-old statue that the Smithsonian doesn’t think is historic enough. And let me tell you. I know it’s a copy, but, man is it striking. I mean, the courthouse is no jungle temple or haunted mansion, but it sort of proves my point that the Adams Memorial fits anywhere, while lending an air of mystery to its surroundings. The copy looks exact to my untrained eye, although its patina is a different shade. And it looks good against the red brick of the building. Also, looking closer at its arm…there is a small divot in its wrist. It’s not the obvious gash that Clotho sports, but, who knows? Even more interesting, the courthouse is just around the corner from the White House, a mere block away. Which also means that it’s only about 500 feet away from the spot where the house once stood where Clover Adams killed herself, which today is the site of the Hay-Adams Hotel. It is, of course, supposed to be haunted by her. And that means that Clover Adams, whose suicide was the catalyst for this entire story and the reason for the existence of these statues, is part of an almost syzygy of funerary figures: One above her remains, and an identical one, near the spot where she left those remains.